If you watch television news at all, you should know that the presidential election is quickly approaching. Potential candidates are wrestling for the top spot, pundits are speculating, and the rest of us are trying to sort though the exaggerations and hyperbole to discern who we should vote for. We hear quite often that we should vote for the candidate who best aligns with our values. That search for the person most deserving of my vote is usually a futile one. If you have ever wondered how Christian values fit into the American way of life, then Jesus for President is an amazing read. 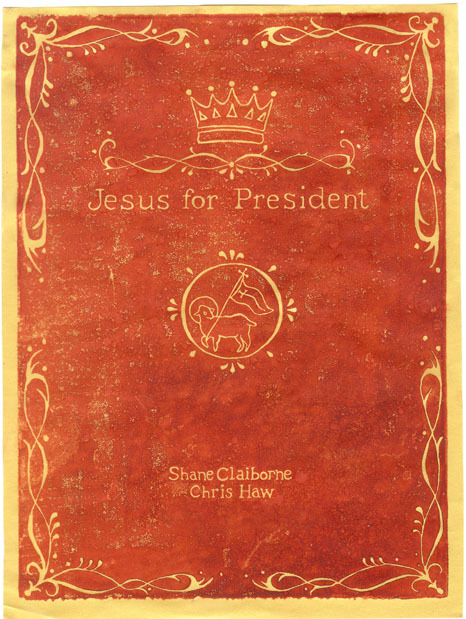 Authors Shane Claiborne and Chris Haw imagines what the platform of Jesus would be if He were running for president. How would Jesus deal with poverty, war, education, terrorism, foreign aid . . .
Jesus for President is not your average political book. It is an artistic experience. The book includes drawings, photos, stories, quotations, and scribbles in the margins that make it visually exciting. Shane Claiborne’s writing typically deals with pretty weighty subjects, and while he does so with great insight and intelligence, Claiborne’s writing is also gentle, humorous, and entertaining. One of the first pictures in the book shows a flagpole flying both an American and Christian flag; the American flag above the Christian flag. The tension created in this common display is the essence of Jesus for President. To what is our highest allegiance, the Kingdom of God and the principles of Jesus or the pragmatism of American ideals? Claiborne and Haw do not share the traditional ideas of religious conservatives. On the surface their ideology seems rather liberal, but as you dig into the book you find a radical way of applying Biblical principles to both personal and societal decision making. This is not a system of belief that fits comfortably into any political philosophy or political party. Jesus for President proposes a new way, demanding that we examine social and political issues with creativity rather than simply selecting from the options offered by the current system. Over the past 20 years there have been numerous books about the relationship between the church and politics. I believe that Jesus for President is one that is more true to the heart of Jesus than most. Even if you are not a politically minded person, you will find this book to be challenging and enjoyable. Is This World One Big Test?